This research project focuses on elucidating the mechanisms by which mutations in the ventricular myosin essential light chain (ELC) lead to different hypertrophic remodeling in the hearts of transgenic mice. We are using single molecule, phosphoproteomic and in vivo approaches to elucidate the ELC-mediated normal (in Δ43 & WT mice) versus pathological (in A57G & E143K mice) states of the heart that ultimately may provide the foundation for specific therapeutic treatments. 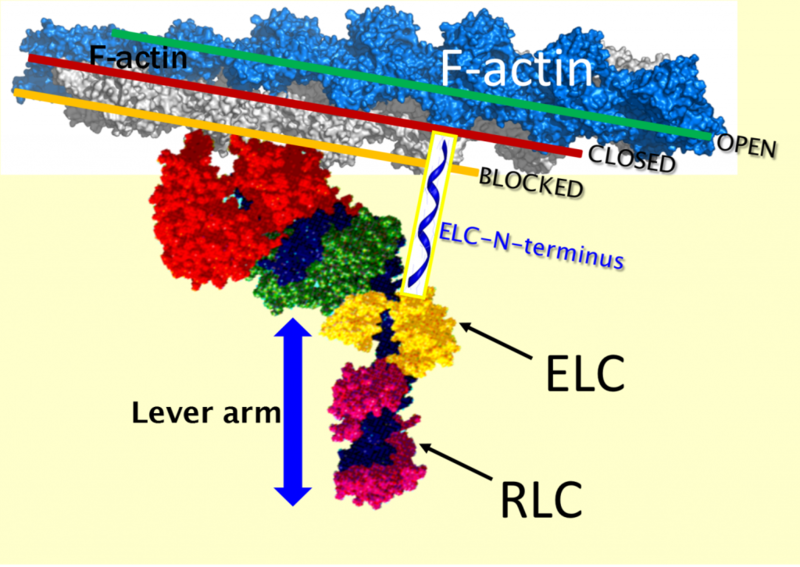 Hypotheses: 1) The ELC N-terminus affects several aspects of the chemo-mechanical cycle of the actomyosin motor and is the major regulator of myosin step-size; 2) It uses the novel mechanism of step frequency modulation to affect power output and myosin power generation in vivo; 3) Different ELC mouse models of hypertrophy originate from different responses of the N-terminus conformation to specific ELC mutations; 4) RCM and HCM associated mutations in the ELC differently alter myosin’s three step-sizes (3, 5, & 8 nm) changing myosin’s power production. They are hypothesized to facilitate (in RCM) or inhibit (in HCM) the transition from the weakly to strongly bound myosin cross-bridges resulting in myosin’s gain-of function (E143K-RCM) or loss-of-function (A57G-HCM) performance in vivo.